Benington is a village and civil parish in the East Hertfordshire district of Hertfordshire, England, about four miles east of Stevenage and 35 miles north of London. There are two theories regarding the naming of the village. One comes from Saxon times and is derived from the name of the river to the west of the village - the Beane. 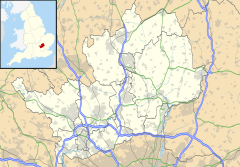 The middle syllable 'ing' is common in place names all over south-east England and means 'people', Benington therefore meaning The Town of the Beane Folk. The second view is that Benington is a corruption of the name 'Belinton' which appears in the Domesday Book. This is thought to mean the town of Bela's people, after the name of the man who led the first group of immigrants to the area. According to the 2001 census it had a population of 922. At the 2011 Census the population had reduced to 908. The village has a strong farming history, and much of the surrounding countryside is still agricultural. The village is served by a local bus route, number 384, between Stevenage and Hertford, which additionally links it to Walkern, Dane End, and Tonwell. It has two churches, a primary school and two public houses. The Bell public house is a grade II* listed building. Benington Lordship is a Georgian manor house which is situated to the west of the village. The grounds surrounding the house stretch over seven acres and also feature the remains of Benington Castle (a Norman motte and bailey castle). The gardens of Benington Lordship are well known for their snowdrops and views over the surrounding Hertfordshire countryside. The gardens also feature a Victorian folly, kitchen garden, contemporary sculptures, carp pond, wildlife areas and rose gardens. Benington High Wood is a Site of Special Scientific Interest. Wikimedia Commons has media related to Benington, Hertfordshire. ^ a b "Civil Parish population 2011". Neighbourhood Statistics. Office for National Statistics. Retrieved 26 October 2016. ^ Benington Village Hertfordshire (2005) " Website - History"
^ "The Bell Public House". britishlistedbuildings.co.uk. Retrieved 12 May 2018. ^ Bennington Lordship Gardens (2006) "Website Home Page"
^ "Benington High Wood citation" (PDF). Sites of Special Scientific Interest. Natural England. Archived from the original (PDF) on 3 March 2016. Retrieved 3 January 2015. ^ "Map of Benington High Wood". Sites of Special Scientific Interest. Natural England. Retrieved 3 January 2015. This page was last edited on 8 November 2018, at 11:33 (UTC).